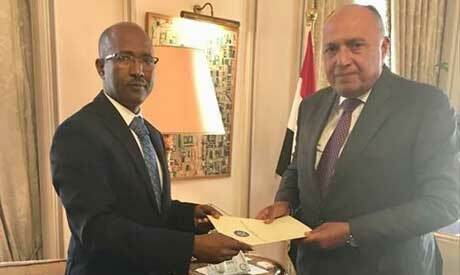 Ethiopia's new ambassador to Cairo Azanaw Tadesse presented his credentials on Wednesday to Egypt's Foreign Minister Sameh Shoukry, Ethiopian foreign ministry announced. According to a press statement issued by the Ethiopian embassy in Cairo, Shoukry expressed Egypt's keenness to continue working with Ethiopia on issues of mutual interest, stressing that Egypt would support the new ambassador in his efforts to strengthen the relationship between the two countries. Ambassador Tadesse said he would exert his utmost efforts to boost the bilateral relations between the two countries during his tenure in Cairo.